Nail art doesn’t have to convey the personality of a client. It can also express the personality of a business. A neighboring business, perhaps? 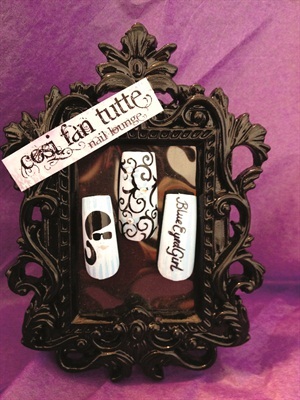 Surrounded by trendy shops in Laguna Beach, Calif., salon owner Jae’tte Burneo found a clever way to introduce herself and her nail salon Cosi Fan Tutte. Burneo collected business cards from nearby stores (hair salons and clothing boutiques, to name a few), then transformed each brand into a unique nail art masterpiece. She put the finished designs in $1.50 frames, attached her salon’s logo to the outside, then presented them to the business proprietors (shown is one she created for Blue Eyed Girl, a hip fashion emporium). “The various store owners got a real kick out of the idea and allowed me to place the adorable displays on their check-out counters where shoppers could see and pick up one of our business cards,” Burneo says. “It’s really been a good marketing scheme.” To try this idea yourself, we recommend choosing businesses with a similar demographic to yours (such as “fashion-forward professionals in their 30s”) to get the biggest return on your time investment.